Erika won chosen as one of 24 candidates for the 2018 Primrose International Viola Competition! Erika Cray performed on Show 291, recorded June 2014, at age 18. Erika Gray (viola), 18, is from Wilmette, Illinois, where she studies with Desire Ruhstrat at the Music Institute of Chicago. A member of Quartet Stracciatella, which won the Gold Medal at the 2012 Fischoff National Chamber Music Competition, she appeared with them on From the Top’s Show 262, taped in Greensburg, Pennsylvania in October of 2012. 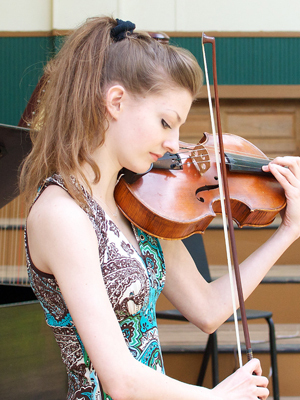 During the summer of 2013, she toured as the associate principal violist of the inaugural National Youth Orchestra of the United States of America with conductor Valery Gergiev and soloist Joshua Bell. She was a finalist in the 2013 American Strings Association Competition in New York City and won the 2012 New Trier Concerto Competition. In the fall, she will be attending the Curtis Institute of Music. Besides music, Erika enjoys spending time with her friends, social networking, and reading.